While the City of Riverside uses reasonable efforts to include accurate and up-to-date information on this web site, it makes no representations as to the accuracy, timeliness or completeness of that information. In using this web site, you agree that its information and services are provided "as is, as available" without warranty, express or implied, and that you use this site at your own risk. The services provided through links on this site are independent of the City of Riverside and are for your convenience only. The City of Riverside does not endorse or recommend the services of any company or service, nor is the City of Riverside responsible for any services or goods provided by such companies. The City of Riverside shall not be liable for any damages or costs arising out of or in any way connected with your use of any information or service accessed through this web site. 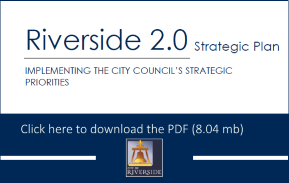 You further agree that the City of Riverside and any other parties involved in creating, maintaining, and delivering this site's contents have no liability for direct, indirect, incidental, punitive, or consequential damages with respect to the information, services, or content contained on or otherwise accessed through this web site. The GIS applications accessed through this web page provide a visual display of data for your convenience. Every reasonable effort has been made to assure the accuracy of the maps and associated data. The City of Riverside makes no warranty, representation or guaranty as to the content, sequence, accuracy, timeliness or completeness of any of the data provided herein. The user of these applications should not rely on the data provided herein for any reason. The city of Riverside explicitly disclaims any representations and warranties, including, without limitation, the implied warranties of merchantability and fitness for a particular purpose. The City of Riverside shall assume no liability for any errors, omissions, or inaccuracies in the information provided regardless of how caused. The City of Riverside shall assume no liability for any decisions made or actions taken or not taken by the user of the applications in reliance upon any information or data furnished hereunder. To be sure of complete accuracy, please check with City staff for updated Information. The use of these applications indicates your unconditional acceptance of the above disclaimer. Thank you for visiting the City of Riverside's Website.